Argentine soccer legend Diego Maradona jived to Latin numbers, and mesmerised hundreds of fans with his football skills in Kerala's Kannur city on Wednesday. Fans flocked to the Kannur Municipal Stadium to get a glimpse of the soccer god. Reportedly, Maradona, who is also the brand ambassador of industrialist Bobby Chemmanur International Jewellers and Airlines, had come to inaugurate a jewellery showroom in Kannur city. 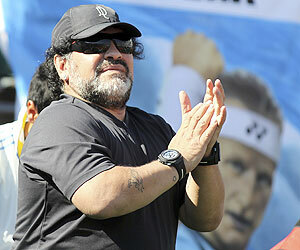 Maradona was seen waving at ecstatic fans and was kicking the football in all four directions. Maradona also exhibited his dribbling skills and shared a few headers with the Kerala's biggest soccer star IM Vijayan on stage. Cashing on the opportunity the event organisers utilised the chance to pre celebrate Maradona's 52nd birthday that falls on October 30 by cutting a three feet long 25-kg cake. Maradona arrived in Kerala on October 23 amid tight security and roaring fans, for a private visit. Widely regarded as the greatest soccer player ever, Maradona led Argentina to a World Cup triumph in 1986, a tournament in which he scored two of his most famous goals. He was on the losing side in the next edition as the defending champions, lost the 1990 final to Italy. Both goals came against England in the quarterfinal. The first one made famous as the 'Hand of God' and the second acclaimed as the 'greatest goal of the millennium'. Maradona was appointed coach of the Argentina soccer team for the 2010 World Cup in South Africa, in a bid to inspire the Albicelestes to another World Cup glory. But they were trounced 4-0 by Germany in the quarterfinals. He was then appointed as coach of the United Arab Emirates club Al Wasl in 2011 but was sacked only after a year of his two-year contract, earlier this year.